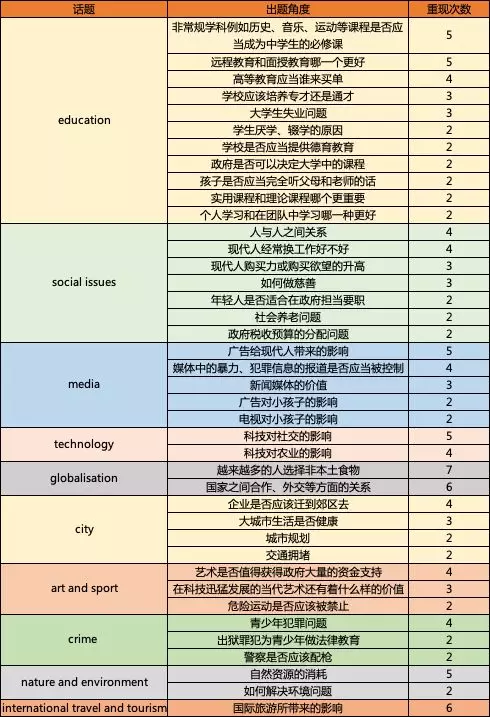 1.Some people consider that school education should be concentrated on academic subjects, which would be helpful for students』 future careers, and subjects like music and sport are not useful.To what extent do you agree or disagree? 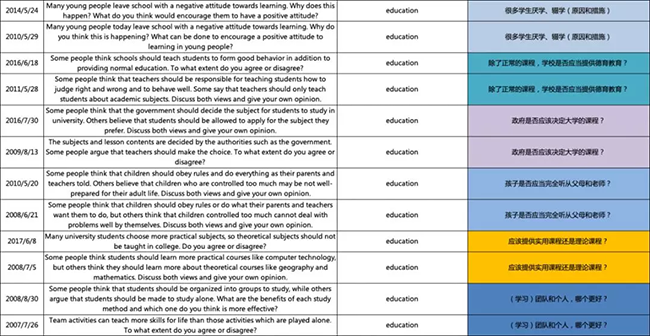 2.Computers are increasingly used in education.In which areas do you think are computers more important and in which areas are teachers more important? 3.Advertising discourages people from being different individuals by making them look the same.Do you agree or disagree? 4.People can perform everyday tasks, such as shopping and banking as well as business transactions, without meeting other people face to face.What are the effects of this on individuals and society as a whole? 5.In many countries traditional foods are being replaced by international fast foods.This is having a negative effect on both families and societies.To what extent do you agree or disagree? 6.Some people believe that the increasing business and culture exchanges between different countries is a positive phenomenon.However, others believe that this could lead to a loss of national identities.Discuss both views and give your own opinion. 7.The natural resources such as oil, forests and fresh water are being consumed at an alarming rate.What problems does it cause? How can we solve these problems? 8.International travel seems to make people more prejudiced rather than broad-minded.What do you think are the reasons for people to fail to benefit from the international travel and how to improve the understanding between different countries? 9.In some countries, students pay their college or university fees on their own, while in some others, the government pays for them.Do you think the advantages that government pays the money outweigh the disadvantages? 10.Some people think that in this modern world people are getting dependent of each other.Others think the modern world gets people more independent of each other.Discuss both views and give your own opinions. 11.An increasing number of people do not know their neighbours, and there is no longer a sense of community.What do you think are the causes of this situation? What solutions can you suggest? 12.An increasing number of people are changing careers during their working life. What are the reasons for this? Does it have a positive or negative development for society? 13.The government should control the violent films and television in order to decrease the crimes in the society.Do you agree or disagree? 14.The range and quality of food has been improved with the development of technology and scientific advance.Some people think it is good and others think it is harmful.Discuss both views and give your own opinion. 15.In many countries, governments are encouraging industries and businesses to move out of the large cities and into the regional areas.Do the advantages outweigh the disadvantages? 16.Some people believe art such as painting and music cannot directly improve the quality of people’s lives so that government money should be spent on other things.To what extent do you agree or disagree? 17.In many parts of the world children and teenagers are committing more crimes.Why do you think it is the case? How to punish them? 18.Some people think that university students should specialize in one subject, while others think universities should encourage students to learn a rang of subjects.Discuss both views and give your own opinion. 19.Some people believe that the country would benefit a lot from a large number of young people entering university.However, others think that the large amount of people receiving the education of university only leads to graduate unemployment.Discuss both views and give your own opinions. 20.Many young people today leave school with a negative attitude towards learning.Why do you think this is happening? What can be done to encourage a positive attitude to learning in young people? 21.More and more people want to buy famous brands with clothes, cars and other items.What are the reasons? Do you think it is a positive or negative development? 22.Developing countries require international organizations’ help.Some people think that financial aid is important.However, others believe that practical aid and advice is more important.Discuss both these views and give your own opinion. 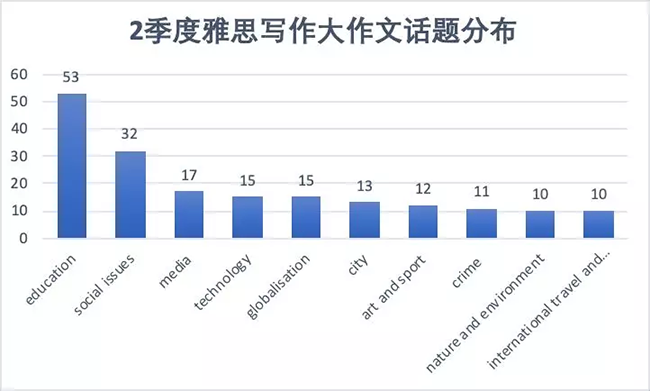 23.News media is more influential nowadays.Some people think it is a negative development.To what extent do you agree or disagree? 24.Some people think living in big cities is bad for people’s health.To what extent do you agree or disagree? 25.People still value artist in the age of advanced science and technology.Why do you think this is? Are arts as important as science and technology?